This challenging tour of the north side of the Telluride valley offers a bit of everything—mountain views, wildflowers, alpine meadows, aspen groves, expansive basins, steep climbs, flowy descents, talus fields, and creek crossings. There are multiple trailhead access points to Deep Creek, but for the full tour, ride it as part of a 16-mile loop from town. 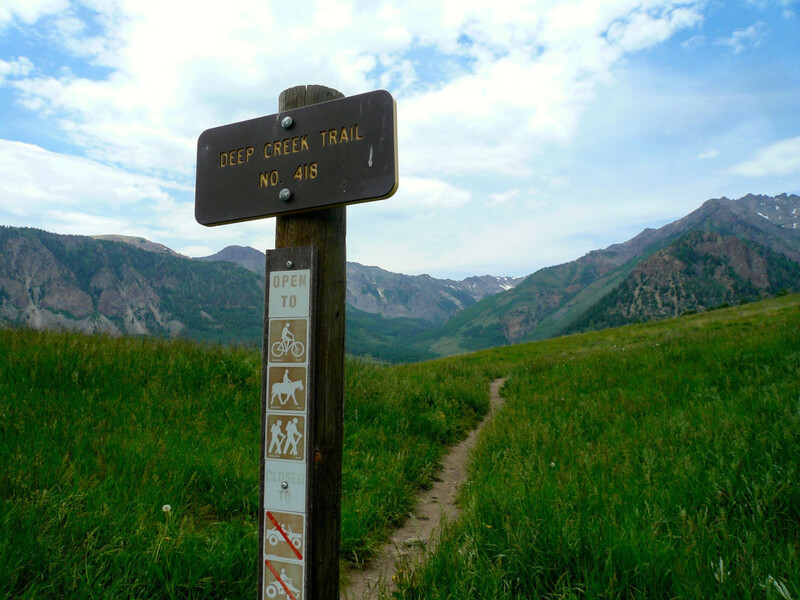 Head east on the bike path for three miles, make a slight right on Last Dollar Road, another right in two miles to stay on Last Dollar Road where it turns to dirt, then find the well-signed Deep Creek trailhead on your right. The route is well marked from here, with some 8.5 miles of twisting, technical singletrack before connecting with the Jud Wiebe Trail. Hang a right on the Wiebe for your quick, steep descent back into town. Be prepared to sweat! This route is a stout challenge—even more so if you opt to ride it east to west. Either way, you’ll gain (and lose) some 4,000 feet of elevation along your route—sometimes on smooth, manageable trail, other times on steep, technical sections that will almost certainly require some hiking with your bike. The route tops out around 10,550 feet between the Eider Creek and Mill Creek/Waterline connector trails before dropping you into a scenic basin lined with craggy, granite peaks. 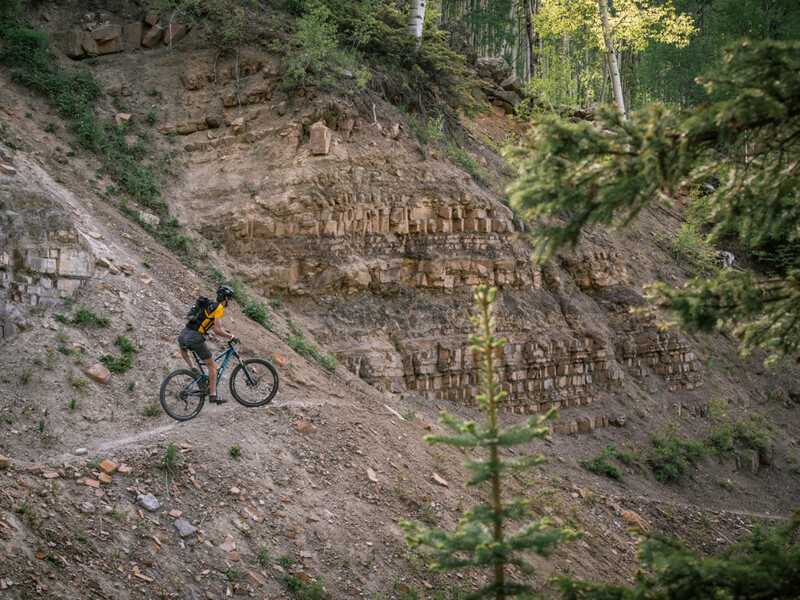 From there, cruise your way through mind-bogglingly dense aspen groves; on sunny days, these offer nice, spackled shade while also making the trail a bit hard to read on more technical sections. Around Mill Creek, you’ll be deeply immersed in lush fir and spruce forest before emerging at a footbridge over the roaring rapids of Mill Creek and beneath some high cliffs. This is a nice spot to take a breather and check out old mining artifacts scattered about before finishing up your loop on the relatively smooth, more evenly graded east end of the trail. Because there are multiple trailhead access points, you can ride this one in sections at first before committing to the full loop. It also lies on the sunny side of the valley, so the lower sections of the trail—from town to Mill Creek, and from Last Dollar Road to Sheep Spring—melt out long before many of the other mountain-biking routes around town do. In its entirety, this trail is best suited for the intermediate to advanced mountain biker, or anyone who doesn’t mind a significant grind in order to score outstanding views. Come fall, Deep Creek—with its plethora of aspen groves and expansive views of the Telluride valley—is prime leaf-peeping territory. If you ride east to west, street parking or free, all-day parking at the Carhenge Lot off West Pacific Ave is available in the town of Telluride. If you ride west to east, a small, free trailhead lot is available off Last Dollar Road. For a shorter ride, you can also park for free and pick up the trail at the Eider Creek trailhead or Deep Creek trailhead at the top of Mill Valley Road.